The detail is amazing, and you really seriously want to embiggen it; I had to shrink it a lot to fit it on the blog. Going over the details at Olsen’s site just amazed me more and more. First and foremost: He took these images with a 25 cm (10”) telescope that he made himself. That’s incredible. A ‘scope that small is not one you’d think you could get this kind of image with, but persistence pays off. It took a total of 43 nights across February to May of 2013 to pull this picture off. Centaurus A is a very interesting object — the product of galaxies in collision, it has a massive black hole gobbling up stuff in its center. As Plait notes (with awe! ), Olsen with his very modest-sized home-made telescope was able to resolve the tell tale jets that the black hole produces (see Plait’s piece for the close – ups). I’ve done a little bit of star gazing, and I worked with Tim Ferris on the development of his Seeing in the Dark film — a kind of love note to the amateur astronomer community, so I have some sense of the skill and sheer stamina of those folks who spend night after night staring up. And even with that as context, I can say that what Olsen does here is truly impressive. So enjoy. Stare at that image (do hit the link for the big version — and check out Olsen’s gallery). Note that in the shock of collision you likely get ramped-up star formation. In star formation, you get planets. With enough heavy elements (i.e., enough generations of stars aborning and flaming out), you get the basic chemistry of life. Not saying there’s anyone looking back…but (allowing for the time lag) you never know. Consider this a cosmic open thread. Image: Rolf Olsen, 2013, used by permission. 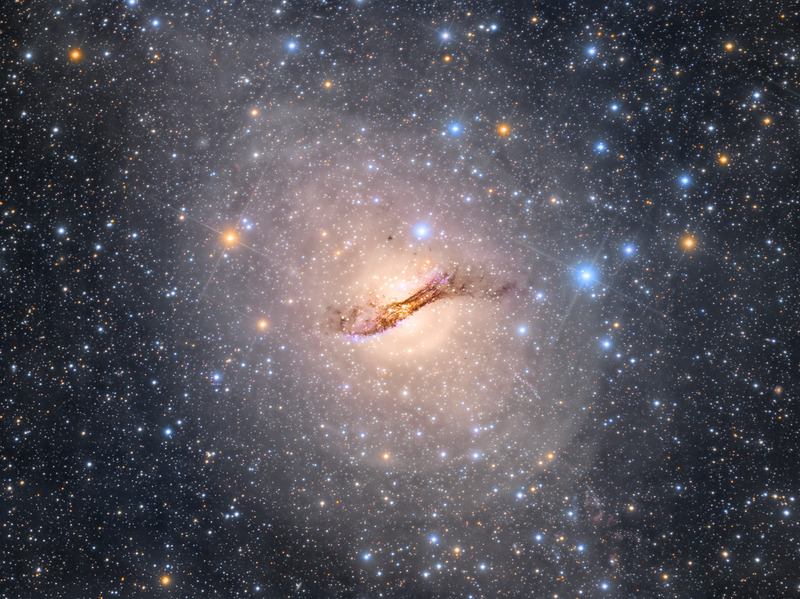 This entry was posted on May 29, 2013 at 4:16 pm and is filed under astronomy, Cool Images, Science. You can subscribe via RSS 2.0 feed to this post's comments. Are you still cross-posting at Balloon Juice? A quick fact-finding trip there and I found myself sucked into a thread and leaving a comment with language that I’m sure my 74yo mother would not approve of … and I’m still unsure if you’re c/ping there. I barely made it out with the remaining hours of my day intact. The reason I ask is because I’m [painfully] gearing up for iGoogle’s demise. Gah. Which feeds to sacrifice while I decide where best to park my surviving feeds? So, if you’re c/ping everything at BJ, I’ll keep BJ. If not, BJ gets tossed. Not that I don’t love BJ, I do. Thing is, I always know where to find Cole & Co with or without a feed. But I particularly appreciate your posts. Sorry for the long delay in replying to this. I am still cross posting at Balloon Juice, but I’m down in frequency everywhere until I get the next book to escape velocity. Again — apologies for the delay; travel, life etc. get in the way sometimes.